and the smallest of the aloes. It has distinct teeth at the margins. The leaves turn into a mimetic earth-colour in full sun. Origin: Southwestern Madagascar (Toliara) . Habitat: Shallow soil at top limestone cliffs at low elevation. 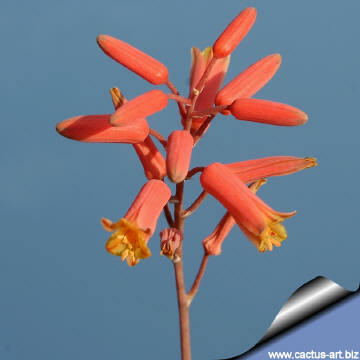 (approx 350 m) Aloe Descoingsii is endangered in habitat. Leaves have white beautiful markings and distinct teeth at the margins. Description: Aloe Descoingsii is a miniature (The smallest of all Aloes) with flattish heads to 5 cm in diameter. Leaves: About 8-10. 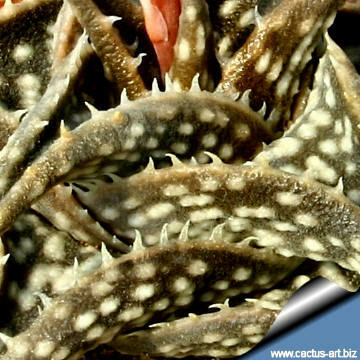 Stiff, short, densely rosulate ovate, curled up into inside, attenuate 3 to 6 cm long, glaucous green to dark grey-green ( or earth coloured in full sun) surface rough with many dull white beautiful markings and distinct white cartilaginous marginal teeth, up to 1 mm long, 1-2 mm apart, becoming obsolete toward tips. 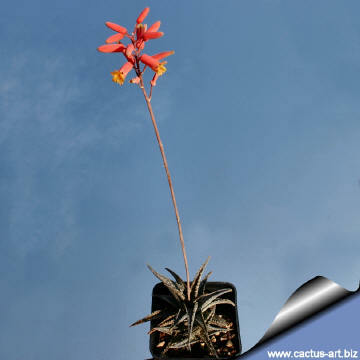 Flowers: On a short (12-18 cm tall), graceful unbranched stem, scarlet-orange with yellow petal tips. 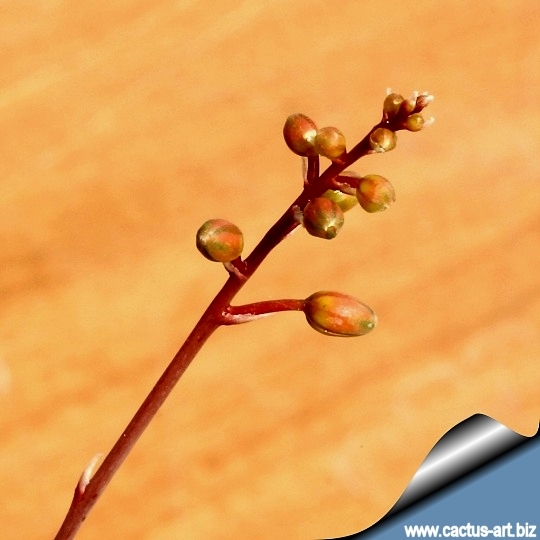 The flowers are urceolate with a flat and shortly attenuate base, 7-8 mm long, 4 mm in diameter. Blooming season ( In Europe): Summer. 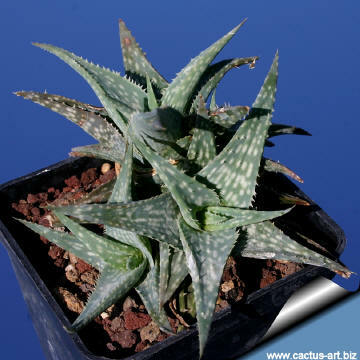 Cultivation: Aloe descoingsii is a popular and most rewarding pot plant. 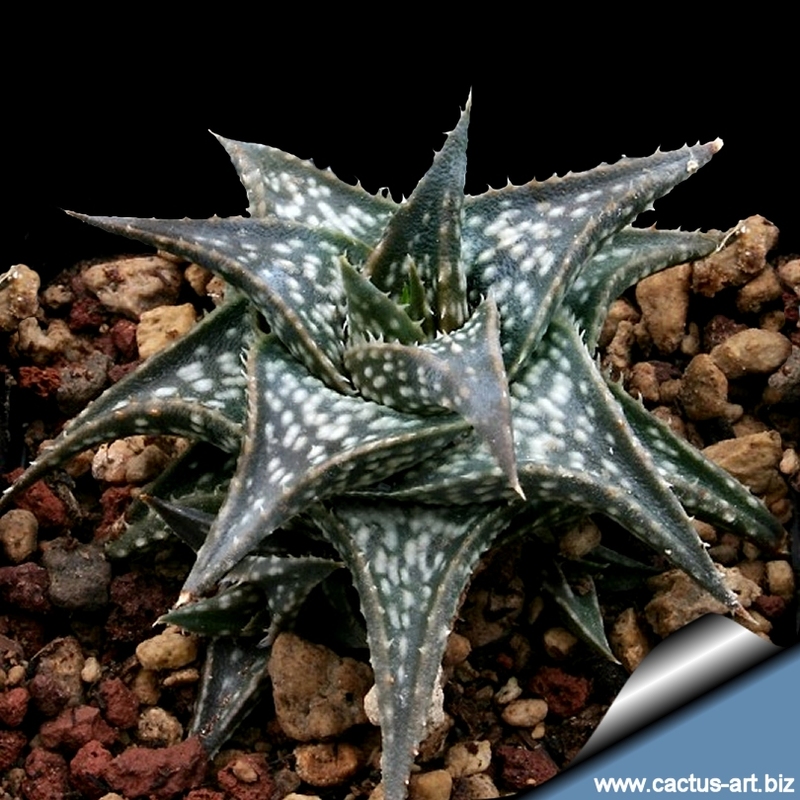 It is relatively easy to cultivate under a wide variety of climatic conditions provided it is planted in a well-drained situation given adequate water but not over-watered. It enjoys light-shade and clumps readily. It may be grown in full sun too but protect in summer from afternoon sun, and avoid reflected heat. Plants grown outdoor can withstand light frost and prolonged drought and can survive often for several seasons without water, at which point the leaves turn a reddish colour, a sign generally associated with stress. Frost hardy to -2°C. 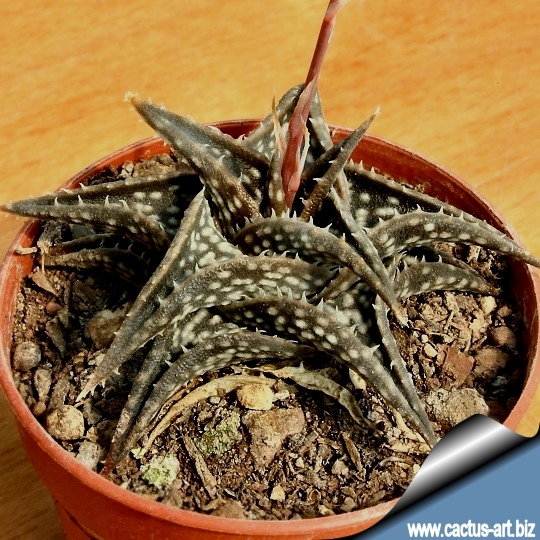 Maintenance: Removal of old flower stalks; During the winter months, the plants should be grown cool to initiate flower development (about 5-10°C ). Reproduction: Usually by cuttings, it is also possible the propagation from seed which germinates easily if sown in well drained soil and covered lightly with fine sand. Seedlings grow fast, reaching flowering size in three to four years. Seeds must be sown as fresh as possible. Fresh seeds germinate quickly at 18°C.